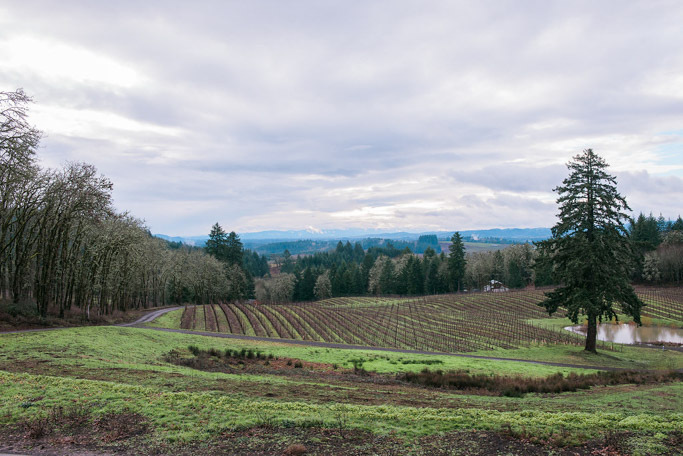 Alexana Winery in Newberg, Oregon, is a quick 30-minute drive from Portland. 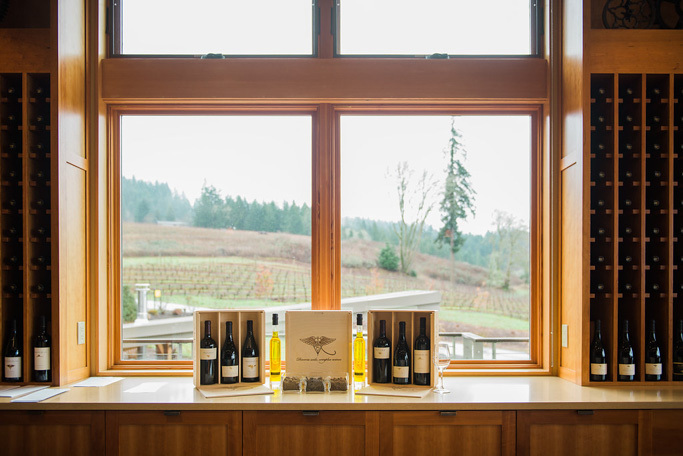 It’s the perfect place to enjoy a diverse tasting of Willamette Valley wines. Rick and I have been wine club members of Alexana Winery for just over a year. Every time we go there, I am swept away by their amazing wines. The winery was born of Dr. Madaiah Revana’s love of the great wines of Burgundy. In the spring of 2005, he began a search for both the ideal region and an experienced winemaker with the goal of producing Pinot Noirs that could rival those from Burgundy. His search ended in Oregon’s Willamette Valley, where he met Lynn Penner-Ash. A match made in heaven was born. 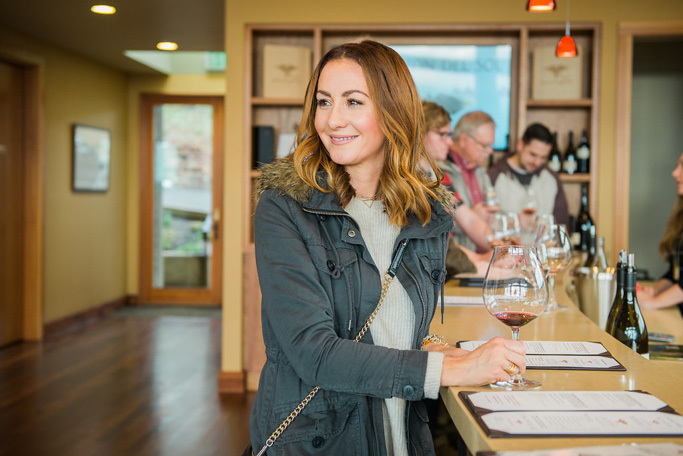 When you’re greeted at the tasting room, you’ll be given a selection of five wines to taste, along with a bonus pour of your choice. For my pick, I always go for their Riesling. If you’ve been reading my blog for a while now, you may know that I’m a huge fan of Riesling. It’s an awesome wine for pairing with a diverse variety of foods. Alexana is pouring a really elegant off-dry Riesling. Every time we visit, I pick up a bottle. Moving on to the reds, the Pinot Noir tasting is where it really gets interesting. 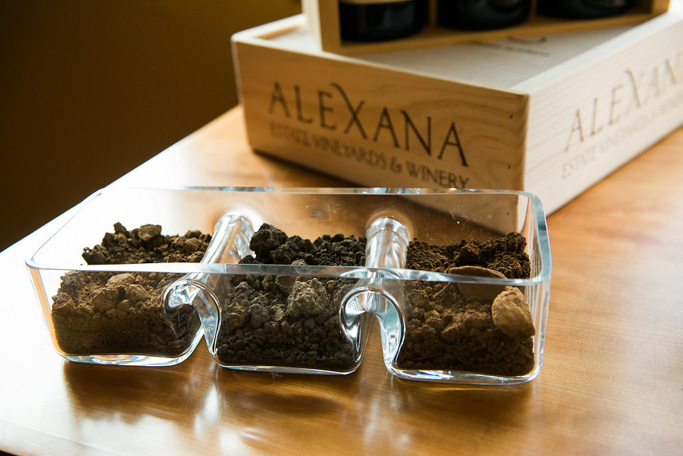 Alexana Winery’s 80-acre property possesses an incredibly diverse series of soils and exposures. Eighteen soil types spread over a combination of rolling hills, steep slopes and rugged terrain. You’ll see them displayed as layers along their expansive 20-foot bar. How pretty is that?! It’s like fancy sand art. 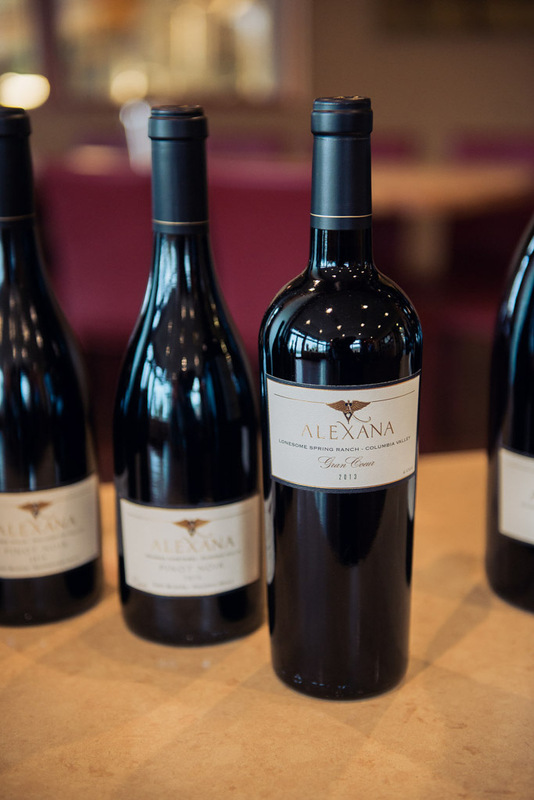 A tasting of 6-wines at Alexana Winery is $20. Be sure to visit them at 12001 NE Worden Hill Road in Newberg, Oregon. 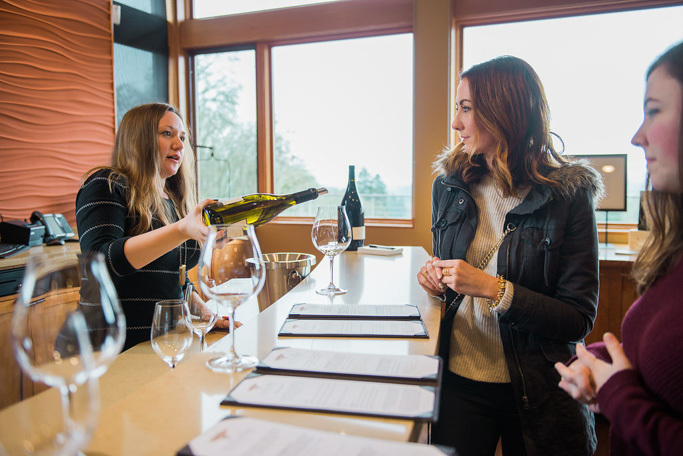 Other notable wineries to check out in the area are Lange Estate, Raptor Ridge Winery, and Sokol Blosser. All the lovely photographs for this post were taken by my extremely talented friend Deann Orr. If you are in the Portland area, I’d highly suggest booking a session with her. She makes even the extremely camera shy (like me) feel comfortable! Be sure to check out her site for more of her amazing work. NOTE: I am a member of the wine club at Alexana Winery, and I pay for that membership out of my own pocket. I was not compensated in any way for this post. Thanks so much for the love! 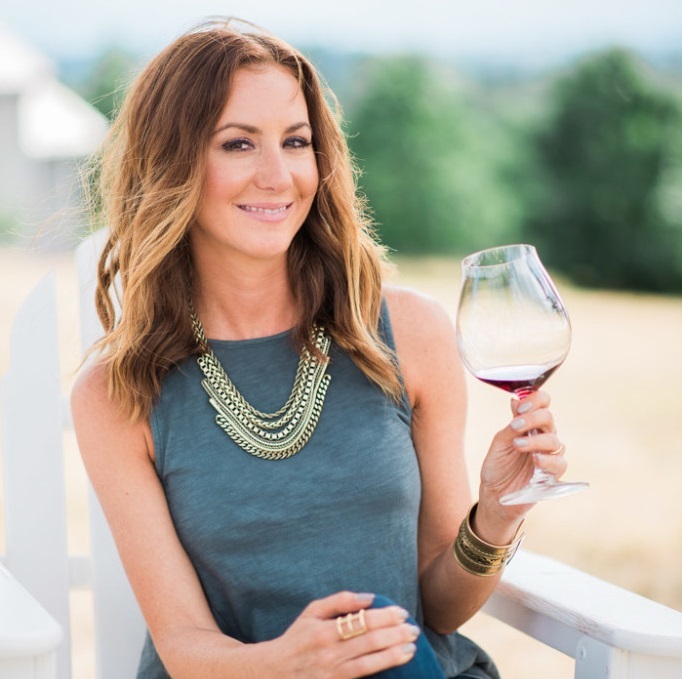 As always, I am so impressed by your knowledge of local Oregon wines. Love your posts! 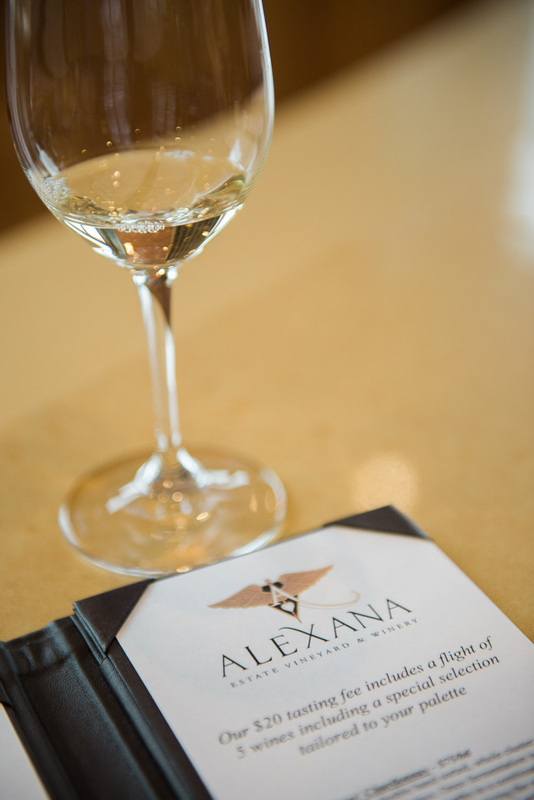 I haven’t been out to their winery yet, but I have enjoyed the wines that I have tasted by Alexana Winery! I need to make a trip out there. 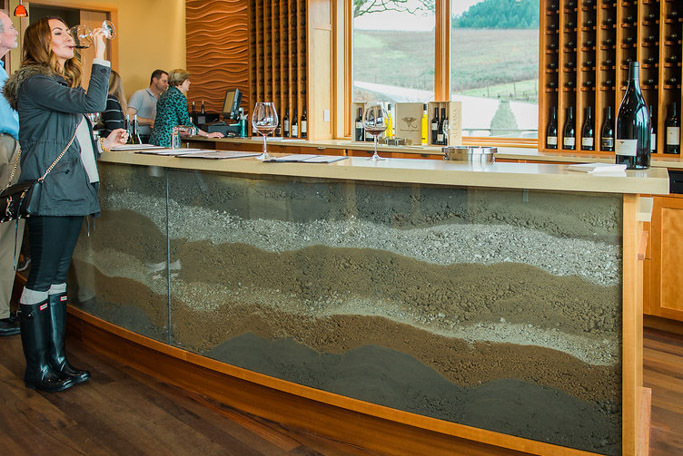 Love the beautiful tasting room bar that artfully displays the 18 different types of soil. Such a creative and beautiful touch! Aren’t their wines fantastic Marlynn? Their tasting room is really beautiful too! Looks like a lovely winery! I need to add this one to my ever-growing list of wineries to visit. Alexana is definitely one to visit Lauren! I love their wines!!! The Chardonnay sounds like how I enjoy Chardonnays. I’ll have to go and try this winery. It’s really, really amazing Aubrie! It has a unique quality that really shines through.